Today is a day for Americans to celebrate and show respect for our flab. It is a representation of our independence and of our unity as a nation. 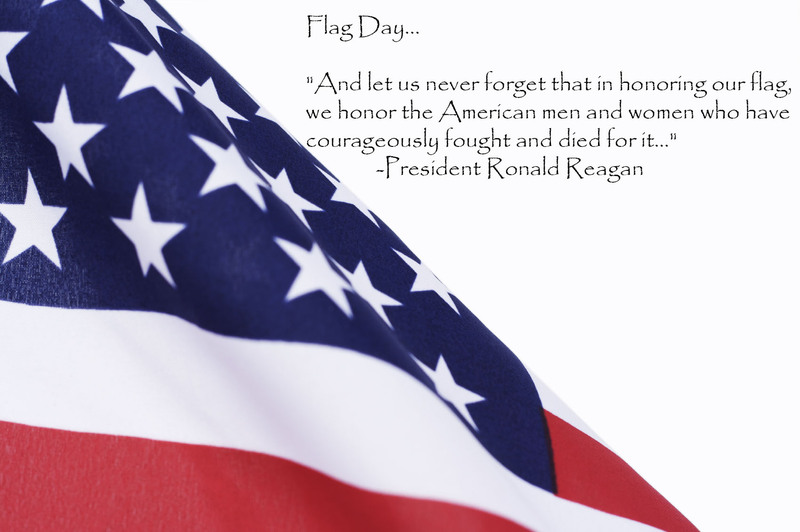 The American flag has a proud and glorious history. It was at the lead of every battle fought by Americans, many people have died to protect it, and it even stands proudly on the surface of the moon! Care and handling of the American flag is steeped in tradition and respect. There is a right way and a wrong way to display the flag. This is called Flag Etiquette. The American flag should be held in the highest of regards. It represents our nation and the many people who gave their lives for our country and our flag. -The flag is normally flown from sunrise to sunset. -In the morning, raise the flag briskly. At sunset, lower it slowly. Always, raise and lower it ceremoniously. -The flag should not be flown at night without a light on it. -The flag should not be flown in the rain or inclement weather. -After a tragedy or death, the flag is flown at half staff for 30 days. It's called "half staff" on land, and "half mast" on a ship. -The American flag is always flown at the top of the pole. Your state flag and other flags fly below it. -The union is always on top. When displayed in print, the stars and blue field are always on the left. -Never let your flag touch the ground, never. -Fold your flag when storing. Don't just stuff it in a drawer or box. -When your flag is old and has seen better days, it is time to retire it. Old flags should be burned or buried. Please do not throw it in the trash. There is a very special ceremony for retiring the flag by burning it. Your local Boy Scout group knows the proper ceremony and performs it on a regular basis. If you have an old flag, give it to them.